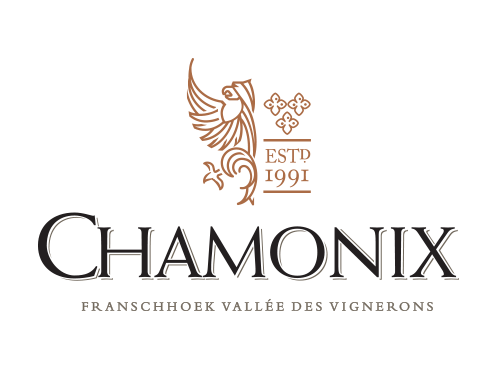 Chamonix Chardonnay on release has a bright straw colour with greenish highlights and an intense aroma that recalls ripe apples and pears with hints of herbs and tropical fruit. Bright and steely dry in flavour, the grapefruit and spice sensations are buoyed by zesty acidity that refreshes the palate through a smooth finish. Grapes are soft-crushed and the must separated from the skins; fermented at 14-16° C for about 2 weeks in stainless steel tanks. The wine, of about 13.5% alcohol, matures for 4-6 months on the lees in tanks before being bottled and cellared until release. We release our Chardonnay Reserve in the second year after the harvest. It has a bright straw yellow colour with golden highlights and exquisite aroma, with scents reminiscent of tropical fruit, ginger, spice and oatmeal. Well structured, with flavours of lime and toasted almonds on the palate. Prime drinking begins at 3-4 years, although top vintages remain impressive for up to 10 years. Grapes are de-stemmed, soft-crushed and the must macerated with the skins at cold temperatures for 6 to 8 hours followed by fermentation at 22-24° C for about 3 weeks without selected yeast (spontaneous) in traditional 228l French Allier barriques. The wine, of about 13,5% alcohol, remains on the lees where it undergoes malolactic fermentation and is stirred periodically in what is known as batonnage. The Chardonnay Reserve is kept in barrels for 14 months and 10% is matured in Nomblot eggs. Each barrel must be judged worthy of the final blend. Sauvignon Blanc Reserve in the second year after harvest shows a pale straw colour, fresh aromas with scents of exotic spice, figs, grapefruit and thyme. On the palate it is full and round with rich fruit sensation and minerality balanced by bracing acidity. The wine reaches its prime in about 5 years after release. Whole grape bunches are selected on sorting tables, stemmed and soft-crushed and the must is macerated with the skins for 18-24 hours at 6-8° C before being fermented in French oak barrels for 10-15 days. 10% of the Sauvignon is whole-bunch fermented 'Maceration Carbonique' and matured in oak. The wine of about 13.5% alcohol remains on the lees in oak for 11 months, with 50% new French oak. De rode 'instapper' van het estate is een boeiende, prettig doordrinkbare blend van Cabernet Sauvignon, Merlot, Malbec en Petit Verdot, die ook in arrangementen zijn mannetje staat. Het zwarte bessenfruit wordt omringd door een rokerige zweem, een hint van koffie en een licht vegetale toets, terwijl geïntegreerd hout structuur waarborgt. Zwoel, rijk en sappig zijn woorden die we er verder op loslaten. Het alcoholpercentage van 13,5% is niet ongebruikelijk bij Kaapse wijnen, maar krijgt zelfs op kamertemperatuur nergens de overhand. Expressief met aanvankelijk rokerige toetsen. Nadien duiken dierlijke aspecten op, vermengd met rijpe kersen en hints van zoethout en specerij. Mollig en volumineus, met een stevig gebrand karakter en een herkenbare toets van stal in de aanzet. In het verlengde wordt de smaak gevormd door de rondheid van alcoholzoetheid en de zachtheid van rijpe kersen. De middensmaak zit stevig in het zuur, met flink wat pit en vurigheid. Het slot is kruidig en getoast, met opnieuw rokerige en dierlijke accenten. On release the Cabernet Franc shows a deep ruby mulberry colour and intense bouquet with scents reminiscent of bellpepper, red berries, spice and cigar box. A wine of ample structure fills the mouth with concentrated fruit and berry sensations. The Feldspar Pinot Noir has a bright red colour. The bouquet is complex with scents recalling wild berries, spice, sour cherries and violets. On the palate the wine shows medium body with fruit flavours balanced elegantly bt tannins in a long finish. The Chamonix Troika (meaning: Russian sleigh pulled by three horses) has deep ruby mulberry colour when young, with scents that recall vanilla, sweet ripe cherries, blackberries, cinnamon and other spices. The wine is amply structured, full, round and smooth on the palate with rich fruit and berry sensations, fine harmony and length of flavour. Although impressive young, it should reach a prime at 10-15 years. The Chamonix Pinot Noir Reserve shows a ruby red colour, with notes of cherry, wild red berries, crushed black pepper, cinnamon and violets on the nose. Although firm in structure and intense in flavour, textures are mellow and round, expanding with time to extraordinary opulence and length on the palate. It should reach its prime in about 5-8 years after release.